Very few writers have the ability to reach deep into my soul without my knowing and surprise me by bringing my emotions to the surface while reading. Erin Bow has mastered the heartfelt sneak-attack. 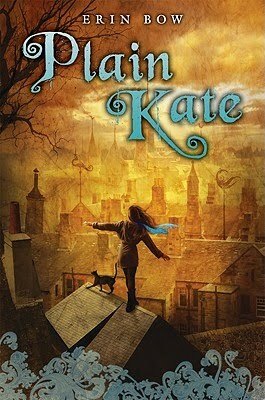 Plain Kate is the story of an orphaned girl whose struggle for survival is brought to the penultimate when an albino witch makes his mind up to claim Kate’s shadow. In a world suspicious of anything different, Kate’s skill as a Carver keeps her balanced between freak and friend as she is forced to run from the only life she ever knew and find a way to be whole again. Bow’s characters take their time to weasel their way into your heart as the story progresses. Beginning with relatively minor problems, Bow allows the reader to become familiar with Kate, Drina, & Taggle the cat. This can be a bit of a gamble for keeping advanced readers in check, but as a middle grade novel aimed at pre-teens this gradual approach invests readers in the lives of these characters. Bow’s antagonist, the male witch Lenay, is finely crafted to the point where as reader you wonder if his ultimate goal truly is justified and worth the sacrifice; until Kate, with Taggle’s help, comes to her senses and realizes that an eye-for-an-eye really only makes sense to those blinded from their humanity. Allowing the reader to bond with and feel bad for Lenay, gives him a nightmarish controlling power beyond the simple notion of good vs. evil. But revenge is a dish best served cold. Kate and readers’ hearts alike will ice over at the realization of just how far Lenay’s insanity will take him. The only niggling comment that keeps me from awarding Plain Kate a perfect score is the sense of detachment and distance between Kate and and the reader in the first chapter. I can only attribute it to a combination of back story and rapid forward progress to the point of Kate’s being orphaned. That disconnection hovered over me like a ghost for the next two chapters. Bow gradually reconnected me with the immediate story and the characters, like a well-woven scarf. When the time came for me to set the book aside for the night, I was pleasantly surprised to find how difficult it was to do. The cathartic emotional roller coaster Bow brings to the conclusion fights my logical disgruntlement from chapter one, swinging the pendulum in favour of a perfect score. My heart has not been wrung through so thoroughly by a book with such intense emotion in a long time. First chapter aside, this is a must read novel for fantasy loves still young at heart.